Happy Bloggers Challenge Friday! Thanks to those who played along with the Fabulous Florals Challenge last week. This week's challenge is Happy Birthday. If you've been a long time player of the Bloggers Challenge, you know I usually throw in a "Birthday Challenge" when someone I know is celebrating their birthday. The projects in my post today are created for my wonderful Mom who is celebrating her birthday this weekend! I hope you have a fabulous birthday! I created my projects using templates from SVG Cuts Dress Shop Kit, cutting the card from Black and White card stock, and the dress from from Black and Kraft card stock and Graphic 45 pattern papers. 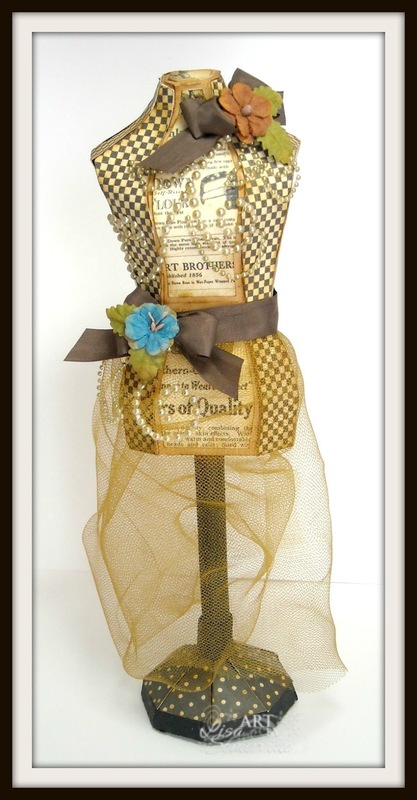 I embellished the dress form with Tulle, Vintage Brown Seam Binding, Zva Creative Crystal Gems and Petaloo Blossoms. 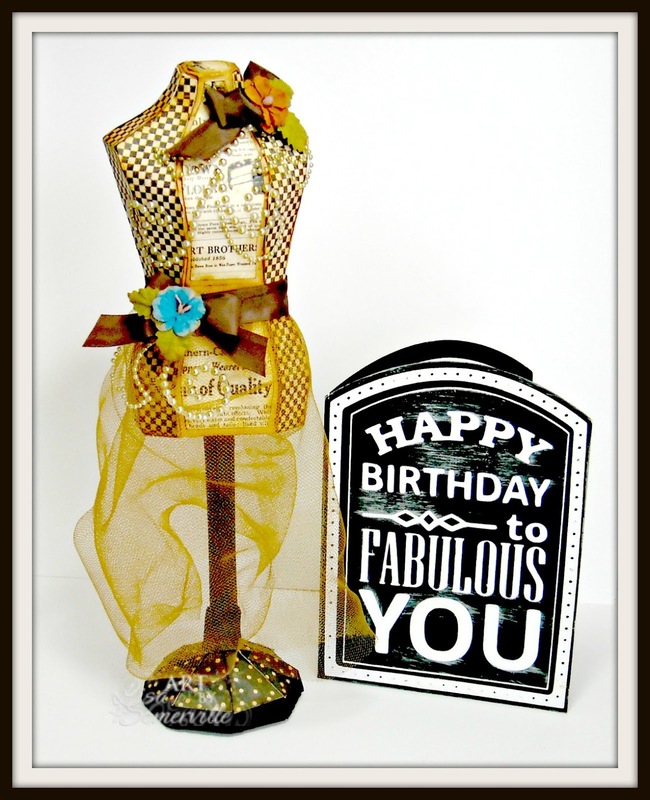 If you'd like to play along with this weeks Bloggers Challenge, please link back to this post on your blog and mention you created your card for the Bloggers Challenge Happy Birthday Challenge. Please add your link using the Link Tool below, your link should be a direct link to your Bloggers Challenge Post, use your name as the Title. Please do not link to cards that were created prior to the challenge date. Entries not linking properly, or backlinked will be removed. If you have the captcha enabled on your blog, please consider turning it off, as it makes it so much easier to leave comments. What a fabulous gift ensemble, Lisa! Love how you "dressed up" the dress form. Hope your mom has wonderful birthday! What a great birthday gift! This is just sew fabulous, Lisa! Love that dress form! Oh and Happy Birthday to you as well! Enjoy! Lisa this is so inspirational and innovative...love it all and especially the little birthday card in Black and White...love the chalk board look. I am so in love with this project! LOVE the DP and the pattern too. Happy B-day to you- how fun to share your special day with your Mom! This is gorgeous, love the colors of it. Hope you and your Mom both have a fab bday. Love your birthday ensemble. The papers you used were perfect. Hope you and your Mom enjoy your birthdays! Fun Challenge! I love birthdays!! I am just so late on creating for them, always. So this challenge helped me to push and create before a friend's birthday, rather waiting til' later!! Good job on your mom's gift, Love it!! !